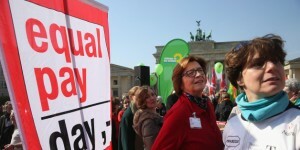 Today marks Equal Pay Day, and I wish I could join in celebration. But it’s not a celebration. It’s an annual day of protest that shouldn’t be necessary. Lip service from those such as GOP frontrunner Donald Trump do nothing to address the history of wage discrimination against women in the workplace by those very same people. One corner of their mouths utter the obligatory “of course we want that” with a wink and a nod while the other corner whispers “not really”. Women continue to make less then men in the same positions performing the same duties and possessing the same (or even better) qualifications. Why is this? The answer is rooted in an insidious Evangelical theology that has embedded itself in our social and political system for far too long. Those chains are finally, though gradually, being broken one link at time. I will celebrate Equal Pay Day when it’s actually a celebration – when women are actually being paid the same wages as their male counterparts. Until then, it remains a day of protest and for me a day of anger for the battle women have had to fight and continue to fight in 2016. This entry was posted in Current Events, Feminism. Bookmark the permalink.